Chania Harbour is a vibrant, noisy and constantly changing place to berth. We initially found a slot alongside a happy group of Poles who were preparing to sail a red lumbering giant of a boat back to Gdansk. I wish we’d taken a photo. Realising we’d stumbled into a ‘marina’ we made our way back to the quay where we slotted in alongside a British Hunter Legend, owned by a very helpful guy who we enjoyed getting to know over the coming days. Our plan had been to meet up with new friends near Chania then move along the coast to Spinalonga and back to Chania for the arrival of Ivan and Hazel, fellow ‘TransMedders’. However a sudden squall heralded a spate of unseasonal and almost wintry weather which kept us tethered to the spot. As the cloudy and intermittently rainy days progressed we settled into our favourite type of quay-living. Getting to know folk on adjacent boats, greeting newcomers and exploring the sidestreets. We found the launderette and the best nearest cafe to sit and wait out the cycle, the lady who rescues injured and stray dogs and cats, the sponge diver who trims his treasures then sells them from his boat ( while his wife charms the passers by with smiles and waves) the gentle old fisherman who makes bowls and monkey fists from rope scraps and the soup kitchen serving hot meals to many every night. On the early morning wee-run with Kezzie, Simon discovered the graffiti decorated streets where the squatters live ( interestingly these homes have the best tended courtyards and flowers) and witnessed the weary clean ups of the late night bars. One fine day a group of enthusiastic students spent several hours erecting a small wooden kiosk which arrived as a flat pack. They finished the job and trickled away as the sun and wind wore them out. 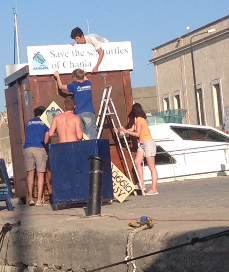 Sometime later they reappeared with sandwich boards and merchandise…our heroes were here, in Chania to raise awareness for, and save, the turtles which annually return to and breed on a nearby beach. The rota of manning the kiosk began and of course we were amongst the first to interrogate them and hear their stories. This energetic bunch had travelled from New Zealand, Ireland, London and even Mexico to spend the summer in tents. One chap, Renee, the Mexican was very keen to talk about spice! When I told him we had some Valentina chilli sauce on board he positively drooled with nostalgia. Presenting him with an egg wrap laced with the sauce was a blast… he could hardly contain himself. If you know Valentina you will inderstand!! By the way we are running low…you know who you are!! And so to The Bench. A metre or so from the foot of our passarelle was a bench. Just an ordinary seat but we started to notice the folk who sat there. The exhausted young parents with the baby who obviously wouldn’t sleep, the pair of girls who poured their hearts out to each other for ages and ages, the curious holiday makers, the bickering children, beautiful women impeccably dressed and scruffily ( like us!) dressed guys with rucksacks. Kezzie and the boat ( why the name Rope Sole? 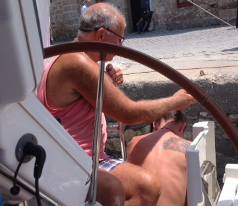 and is our home port really Lymington? ) always draw attention and we enjoy chatting, so you can see why we love living this way. One night we returned to find a well dressed guy wearing a crocodile dundee hat, sitting on the bench and gazing out to the harbour wall beyond. We chatted about Chania and the loud live music which had chased him away from his official function at the nearby Taverna. Also about his life, politics ( which countries are currently talking to each other and which are not ) and his job at a ministry desk juggling electronic weaponry. He stood, a little revived, and uncomplainingly made his way back to the most important task of international diplomacy. The following morning we specifically prayed that we would have living water to give the next people who sat on the bench. And that was the beginning of the story of Carlos….which involved earl grey tea, cake, a haircut and some living water. We hope to keep in touch with this brave guy.